The TOEFL, or Test of English as a Foreign Language, is an exam designed to test one's ability to use and understand English in an academic environment. It was created to address the problem of ensuring English language proficiency of non-native speakers applying to American universities. Since then, it has become a standard admission requirement for non-native English speakers at many colleges and universities, and occasionally in other institutions like government agencies or businesses. The Official Guide to the TOEFL Test is one of the most reliable TOEFL prep books out there. Including real practice questions and explanations for each section of the test, this book will have you on your way to acing the exam. This study guide clearly outlines what is expected for each of the speaking and writing tasks, and instructs you on how to create superb answers. Including with the text is a CD-ROM which provides three authentic TOEFL iBT practice exams. If you want a book with over 600 practice questions for the TOEFL, this is the one for you. Reviewers comment that this is one of the best books on the market to help students from non-English speaking countries to prepare for the exam and that they like the detailed explanations of answers, including examples of why one answer is correct, and others are wrong. One drawback reviewers have reported issues with the CD-ROM not working, or not functioning similarly to the actual exam. Called a good strategy book by reviewers, Cracking the TOEFL iBT, by Princeton Review, is an excellent study guide. The newest edition comes with a full-length simulated TOEFL exam and accompanying audio sections. This text also has a comprehensive grammar review to practice those basic skills and a review of core concepts. Practice drills in speaking, listening, reading, and writing ensure that you'll be ready for test day with this study guide. Princeton's guide also includes time-saving techniques and tips on how to ace the Reading and Writing sections of the test, with updated strategies to keep up with changes in the reading section. Like all strong guides, detailed answers and explanations for all the practice tests are provided. Some of the positive features of this book are excellent writing strategies and drills, and fairly challenging speaking and listening strategies and drills, though they are limited in number. One weakness might be that the reading sample questions are reported to be easier than the questions on the actual exam. This study guide put out by one of the giants in the test preparation industry comes packed with materials to get you ready to ace this challenging exam. Jam-packed with over 1,000 practice questions Barron's guide is one of the most comprehensive ones of its caliber on the market. Designed to help students succeed on both the paper-based and internet based exams, this package includes study guides for both test-taking methods. This guide comes with a full-length test in each format, answers with detailed explanations, and supplementary materials with instructions for evaluating your answers and determining your score. Additionally, this guide includes an optional audio CD program of six compact discs that provide practice for the Listening, Speaking, and Integrated Writing sections. 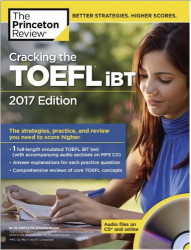 Reviewers comment that this is a reliable and comprehensive resource for preparing for the TOEFL exam. The simulated test more accurately reflects the actual exam than competitor's options, using accurate timing to train yourself for actual test conditions. One weakness is the lack of techniques for how to prepare for the exam and information about the strategies needed for tackling some of the more challenging questions. A good book to improve your writing and speaking concepts. It focuses on argument mapping which will help you to speak and write arguments in an organized way. Book provides useful tips to speak fluently.